We have guidelines for the Earths Land, Air and Water Quality, but no official guidelines for residential indoor air quality, which includes Mold, Dander, Small Animal Parts and Volatile Organic Compounds (VOC). There are also Hazardous indoor materials such as Lead Paint and Lead Dust that could be a concern. Windows, Doors, floors and railings that have been re-painted with non Leaded paint can allow lead to leach out from friction of old windows and doors. Also some wood floors have the same issue with friction and chipping. People and their children usually spend a lot of time inside their houses and/or apartments without ever knowing what is in the air they breath, or what is on the surfaces inside their home. Unfortunately, it`s not until someone has a negative reaction to something in their indoor air, maybe in a specific area of the building, that testing becomes necessary. Determining what particles (in the air) that may be the cause of reactions by people when in their indoor environment is important. Mold spores may trigger asthma in children. Also Children who have been exposed to Lead paint chips and dust during their first 6 years of their lives may lest high for lead in blood content. Basements may be damp from high moisture and water intrusion providing an ideal environment for mold growth. Microscopic spores from mold growth are omitted into the air that we breath in and some people can have reactions such as allergenic irritation of the nose, eyes and throat. Some reactions, especially over time can cause lung and blood issues. The basement and in the room where the basement stairs enter, often a kitchen, with and outdoor sample as a comparison. The reaction(s) may be just a cough or a rub of the nose, others may be allergic reactions that can make people feel like they are getting a cold. Some reactions can be more severe. Mold spores are easily transferred from room to room and floor to floor from naturally occurring pressure in the building and when people walk. Bathrooms with showers may cause enough moisture for mold growth due to lack of ventilation. Attics also can harvest mold growth from lack of ventilation or from a bathroom ceiling vent discharge into the attic instead of to the exterior of the building. Our LET Inspector is trained and tested on discovering Moisture and Water intrusion with 20 years of experience as a Certified ASHI Home Inspector and HUD 203k Consultant. Other health concerns may not be mold related. Some reactions to indoor air quality are from animal & human dander, dust mites and their waste, insect parts, etc. The only way to know is by inspection and testing from a competent certified ACAC Consultant. Find out about our organization, mission, our methods, and the results of over a decade of Inspecting & Testing for IAQ & Mold. 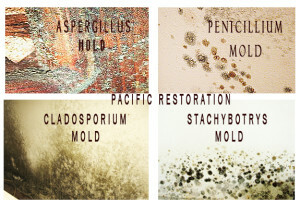 Above are mold species I most often encountered in the Lancaster, PA area that are known causes of allergic reactions. I have seen the above species of mold in many of my laboratory reports that appeared to be the reason for negative reactions in some people. Stachybotrys is known to actually be Toxic to some people. Stachy, usually not found in the exterior air tests may develop only when other mold(s) are present indoors for a while from long term water issues. There are several species of mold throughout Pennsylvania and sometimes several species show up in air testing, but usually at very low levels that are not usually considered an issue for most people. But everyone is different and if someone feels sick when their in their home or at work it can become something that needs attention. That`s why we are here!